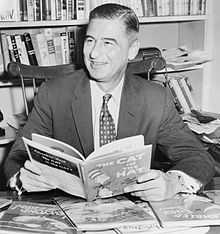 The following is a personality profile of Dr Seuss based on his work. Dr Seuss is social, unpretentious and can be perceived as shortsighted. He is assertive, he tends to speak up and take charge of situations, and he is comfortable leading groups. He is respectful of authority as well: he prefers following with tradition in order to maintain a sense of stability. But, Dr Seuss is also laid-back: he appreciates a relaxed pace in life. More than most people, his choices are driven by a desire for self-expression. Considers independence to guide a large part of what he does: he likes to set his own goals to decide how to best achieve them. He is also relatively unconcerned with tradition: he cares more about making his own path than following what others have done. The Cat in the Hat Comes Back!